Cristino Dominguez came to the United States from Mexico in 1997. 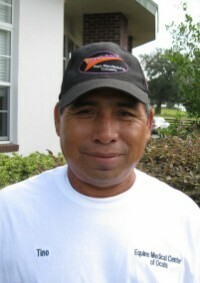 He is currently a member of the barn maintenance crew at Equine Medical Center of Ocala. Tino has 13 years experience working with horses. He currently lives in Ocala with his wife and five children. Tino takes pride in working with his five horses with the help of his family. He enjoys spending time with his family, especially his grandchildren, on the weekends.